We offer our range of silicon carbide seal ring which is manufactured using premium quality raw material. This seal is specially designed to give high performance and is completely reliable. Expert Engineering, an ISO 9001: 2008 certified company, manufactures a wide spectrum of Silicon Carbide Seal Rings using premium quality raw materials. 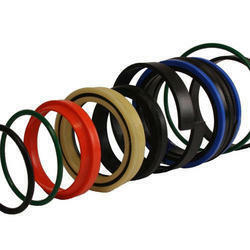 We provide our clients Silicone Seal Ring used in higher pressure applications. These are easy to fit in the lips of various types of appliances. They are highly resistant to high temperature, water, chemicals and other types of corrosion. These are processed with best quality materials which are sourced from leading vendors. We are manufacturer of Silicone Rubber Sealing Ring. We are offering Silicone Sealing Ring to our clients. New Saral Desai & Co. This Silicone Sealing Ring has heat-resistant properties. Our clients can avail from us Silicon Carbide Seal Ring, which is heavy and can be distinguished from silicon carbide. Due to a high modulus of elasticity, it is ideal for high pressure applications as it helps prevent face distortion. For re-use Tungsten carbide also can be polished and re-lapped.